* What about robo-advisors and apps--are any of them any good? "A great intro for newbies to the terribly complicated financial world, mixed with personal advice on how to handle debt and emulate the mindset of the wealthy. A wonderful resource." "Erin is uniquely capable of making even the most difficult-to-understand financial concepts into something you actually want to talk about, and investing is no exception. If you are intimidated (or, frankly, bored) by the idea of investing, let Erin prove you wrong on both counts with this fantastic book." 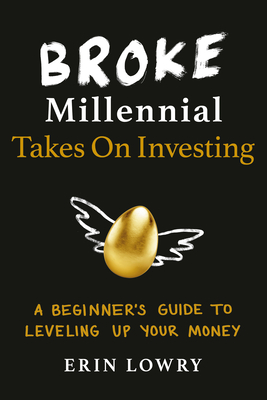 "Broke Millennial Takes On Investing is the beginning investing book you've been waiting for. Not only does she break down investing terms, but she also explains 'the why' in a way that will resonate with millennials and non-millennials alike. What most impressed me is Erin's ability to explain how to invest in a way that is easy to understand and implement. As a former preschool teacher turned financial educator, I can say that this book has all the hallmarks of a great, transformative read. If you're starting your investing journey, bring this book along with you. "Erin compares asset classes to craft beers. Need I say more? She explains investing in a way that's simple and easy-to-grasp without being simplistic. She entertains you with stories of Dutch tulips and Ask Jeeves, introduces you to new technologies, walks you through ethical investing and explains the investment landscape so well, you'll feel like an expert by the time you finish reading this book." "It’s the youthful perspective that makes this book so refreshing. It’s well written and researched by a millennial for millennials. You hear their voices and their concerns without the judgment, sarcasm and superiority we older folks too often convey when we talk to young adults about money." "Erin Lowry's Broke Millennial is a charismatic guide to personal finances for people seeking a modern, thorough introduction to the topic."